My belly is covering Ryan's face! Sleep: Still a little restless. It seems like my bed time routine now involves popping a few tums before I fall asleep. Otherwise, I will wake up with heartburn during the night. Movement: Oh ya! This little lady has been a mover and a shaker lately. I think she's turned from laying across my belly to being up & down. I can't tell if she's head down or feet down though. I've been feeling her kick (or punch) me in the ribs but it doesn't hurt... yet! Unglamorous body changes: Mainly just heartburn. I hope the old wives tale it true that having heartburn means lots of hair on the baby's head. I don't know if I believe it but I guess we'll find out soon enough. Showing: I think I've finally come to the stage where people know that I'm pregnant. But I think certain clothes can still hid it a little bit. People are definitely more freely talking to me about it! Food cravings: I have been wanting a lot of peanuts or peanut butter lately. But I'm pretty sure my husband is still having more cravings then me! He went to a Chinese buffet 3 times in one week and just made me go with him again yesterday. Ha! What I miss: Fitting into cute clothes. I've been trying to find a couple of outfits for some up coming showers and it's so hard! I don't want to pay an arm and a leg for something I may wear once. Best moment this week: So much! One of my good friends, Emily, had her baby boy, Caden James, on Thanksgiving Day!! She is a rock star and had him all natural. I can't wait to meet the little guy in person. I also helped out with my bbf's baby shower (more on that later). AND while I was out of town Ryan kept sending me emails with surprises he was doing for me. He hung all our Christmas lights outside, painted the nursery (twice!) and our crib came in so he put it together!! Isn't the movement great? 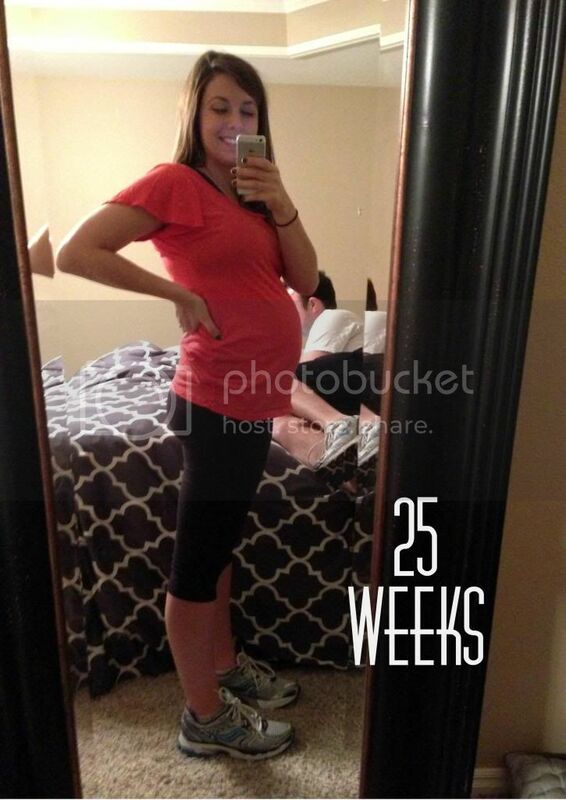 I'm 24 weeks and I am loving it! Such an exciting time, I'm so happy for you!! You cracked me up about Ryan having more cravings, but what a sweet husband for doing all that stuff around the house. I didn't know Emily went the natural route, way to go! I know I couldn't do it. Do you get frustrated looking in your closet full of clothes, wanting to pick something you normally would wear, only to remember it doesn't fit anymore? That used to bug me with Chloe. I understand not wanting to spend much on clothes you will hardly wear. Oh my goodness, that picture with Ryan cracks me up. I swear, he remind me so much of Jeremy some days. You are looking beautiful!